The Associated Board of the Royal Colleges of Music offers exams up to diploma level in voice and various instruments. It also offers to examine people in music theory. The syllabus rarely attracts candidates for its own sake but to take a practical exam beyond grade 5 one needs to have passed grade five theory. And so I often find myself teaching grade five theory to students who have never studied the subject before, picking up the theory they have needed as they learned their chosen instrument rather as a child learns their native language. I had a very good teacher when I studied theory and will boast, at the right time and place, of my 100% result at grade 8. But there is something of the nerdy anorak about this achievement. 'Music theory' as taught for Associated Board exams has nothing to do with any theory of sound, acoustics or even music. It is purely a study of a particular, albeit widely used, system of notation. There is a difference between, say, learning French and learning about language as a broader concept. The notation system we favour has proved remarkably robust in the face of change but is not especially well suited to everything it tries to describe. I have to resist the urge to defend it in the face of disgruntled students who hold me entirely responsible. Syncopation and music in the key of F#, for example, can be horrible to read. The playing would be easier if the notation were clearer. Easier still if it were taught by demonstration and imitation. And perhaps this explains why classical musicians, as a rule, can't 'swing' without sounding like Sunday school teachers at a rave. They are hung up on the description in preference to the reality. After all, why bother visiting Rome if you've already read the guide book? While my expertise in music theory is not wholly useless, I hadn't fully understood my discomfort with it until I read a book review in last Saturday's Guardian. It contained a quote from the book, We Are Not a Gadget by Jaron Lanier (Allen Lane) which goes: information is alienated experience. The ability to write, and so transmit, music and other languages is priceless but the written symbols are merely a description of the real thing. Nose flutes? Saints preserve us! Some children, on getting hold of the latest copy of The Beano, will go straight to the characters they like the best: The Bash Street Kids, Roger the Dodger or whoever. Despite the dangers of confiscation by a teacher, or appropriation by an older child, I would always start at the beginning (Biffo the Bear back then) and work my way through, enjoying the anticipation, until eventually I reached Dennis the Menace on the back page. So when first I opened Polynesian Sound-Producing Instruments by Richard Moyle and discovered there was a section on nose flutes I resisted the temptation to go straight to it, much as it appealed to my inner ten year old. If you live in north-west Europe the fact that nose flutes never really caught on here will need no explaining. The damp climate creates a perfect host for the common cold and noses are frequently either blocked or running too freely. When I even tell young students about the existence of a flute you play with your nose their lips curl with distaste and they treat the information with the same suspicion as when I tell then how Lady Greensleeves got her name. young children are obsessed with bodily functions and secretions and those that emanate from the nose, being not 'rude' but still disgusting, have been a gift to purveyors of comics and other low humour for generations. Perhaps this European distaste contributed to the decline of the nose flute in Polynesia. On many of these islands the instrument was used to serenade one's lover - it made the music of love. It steadily lost ground to the ukulele when this arrived with European visitors in the eighteenth and nineteenth centuries. The ukulele has the advantage that you can croon along as you play. When the Europeans arrived in the paradise that was the Pacific islands they brought missionaries who set about trying to improve the place. Catholics introduced the concept of original sin (guilt) and Protestants brought the work ethic (more guilt). They frowned on many of the rituals and pastimes practised by the indigenous peoples and many were prohibited. In museums there exist instruments from as recently as the nineteenth century whose music and purpose are lost forever. Moyle, whose book was published in 1990, describes curious instruments called sounding boards used to accompany a particular dance on Tonga and Samoa. (Not to be confused with either the sounding boards of Bellona Island or those used in the manufacture of pianos or other European string instruments.) The 19th century Christian missionaries on the islands regarded the dance as 'heathen' and it was outlawed, never to be seen, or heard, again. Bellona, part of the Solomon Islands, has a different type of sounding board. Whereas the Tongan and Samoan boards had a hinged slat that rattled when the board was struck, the board from Bellona has no moving parts. It is a crescent shaped piece of hardwood beaten with two sticks. Although I speak of it in the present tense, Moyle writes that the 'heathen dances' are under threat from the Protestant church which is very powerful on the island. Back to nose-flutes, it would be a pity if the Polynesian type disappeared altogether. There are other nose flutes to be had and a quick search of the web reveals modern, brightly coloured examples in hygienic plastic that can be mail-ordered. I'm sure they are worth a sniff and I shall not be put off by their Christmas-cracker-freebie appearance. Polynesia is not the only part of the world where cultural diversity is threatened by bland commercially driven homogeneity or prudish evangelism. Whether any attempts to preserve its dances and rituals can be successful, once the culture that gave them meaning has been destroyed or diluted, is uncertain. Before I finish with nose flutes (Anglo-Saxons: you are allowed one last snigger) I have a question. Answers on a postcard, or in a comment, please: What is the nasal equivalent of an embouchure? I posted some time ago about the bell tree, one of my favourite instruments. A couple of year three classes (7 & 8 years old) are doing some imaginative work involving magic potions and I have been developing ways of supporting this with music. The bell tree is just right for this; it gives the perfect sound for the casting of a spell. I don't have a bell tree of my own so was delighted to come across one in the school's music cupboard. It is a fine example, reminscent of a Victorian laboratory or a film set for a Sherlock Holmes movie. Unlike the one in the picture, borrowed from another school for a short while last spring, it is mounted in a hard-wood frame making holding it unnecessary and reducing the chances of it being dropped on some poor child's foot. Including, as it does, a fair amount of heavy brass in it's make-up it would hurt a lot and parents would be bound to ask where that nasty bruise came from. So many schools I visit have very poor storage facilities for instruments. In this particular school the cupboard was big enough for what they had but the instruments were in disarray and the space was being encroached upon by unrelated materials and equipment including an enormous television on a trolley that made it hard to reach many of the shelves. Various objects, including an ornate wooden conductor's stand, spoke of former glories and present neglect. I wasn't surprised to discover that the year 3 children had never seen the school's bell tree. They had only been there for a few months after all. What did surprise me was that children in year 5, who had spent more than two years at the place, had never seen it. 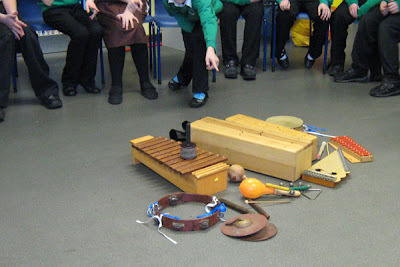 I know a lot of primary school teachers shy away from music because of the noise and apparent chaos. Speaking to practitioners in other fields suggests that there are teachers equally reluctant to explore drama and even art, preferring to stay within their comfort zones but this is unnecessary. While I can sympathise with this 'anything for a quiet life' attitude it is possible to explore music with children without ending up with over-excited children, frosty looks from the person trying to teach in the next room and splitting headache. It doesn't have to be a chaotic free-for-all and I shall share some approaches and techniques in the March edition of Playing With Sound, the free newsletter I put out once a month. In the mean time I intend to make the most of what's left of the half term holiday. I'm probably more a function-over-form, content-over-style person. It isn't that I don't appreciate beautiful objects but if the object has a function then I prefer something ugly but effective to something beautiful but unable to serve its purpose. I recently visited a school where I had been making shekeres with the children in the manner described in a recent post. My sole purpose had been to make the instruments so the children could use them in performance and my plan for that day was to complete them. My lesson plan needed some quick revision, however, because I was met by the class teacher who took me into the art room and showed me how the children had been decorating the shekeres they had spent so much time on the previous week. 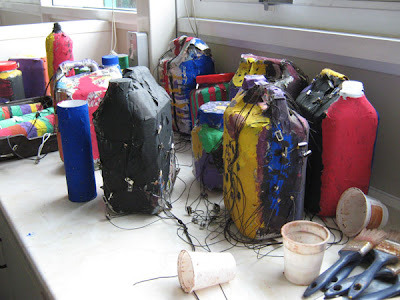 This had involved coating the outsides of the plastic jars and bottles with papier mache and poster paint. I assume it had not been possible to remove the beads and netting and these had become tangled and gummed up with paint and glue. The shekeres are still languishing in the art room awaiting completion. I don't have enough time in the school to get them into a state in which they can be finished and I have steered the workshops in another direction. Of course it didn't occur to me that they should look good. And it obviously didn't occur to the class teacher that I would make these instruments without some thought as to their visual impact. And after all, in most making projects the decoration comes at the end. Obviously we should have talked things through in more detail at the outset but we had no reason to suppose our expectations were any different. I hope it is not a mistake I will make again, and I'm sure it is one most others would have avoided in the first place. On a practical note: decorate your shekeres, if that's what you mean to do, before you put the things together. 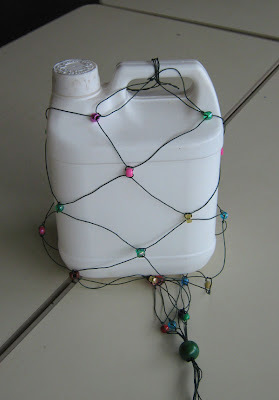 For what its worth, the teacher talked of putting rice into the bottles and jars to make them louder. Given that the beads no longer rattle against the outside that is a very practical plan. But then they will be just so many shakers, an instrument I was trying to avoid, and not shekeres. 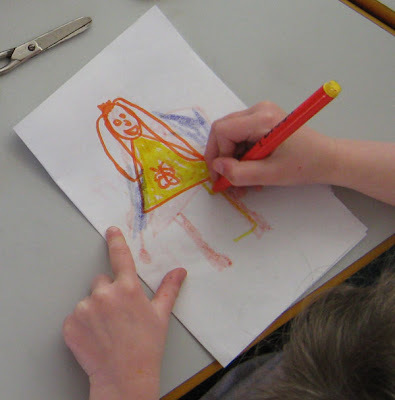 There are several ways of dividing a class of children into smaller groups. It is fun, but time consuming, to have them arrange themselves in alphabetical or age order. If you believe in star signs, and opt for the age thing, you may wish to mix them up a bit afterwards to avoid having all the leading Leos in one group and the recalcitrant Capricorns in another. My own favourite, because wherever possible I begin work in a circle, is to give each child a number. If I want five groups, the person on my left is number 1, next to them is number 2 and so on round. The child next to number 5 is number 1 again. Once numbered, all the ones gather together in their group, as do the twos, threes and so on. I like this because it's fast, transparently arbitrary, breaks up subversive cliques and mixes boys with girls. The other day I found myself working with eleven Year 5 children (aged 9/10). It was my first time in the school and we had 45 minutes to produce some music for a performance based on Creation myths. They nearly all had formal instrumental lessons and most were obviously very bright. Being young enough to 'play' they took to improvising very well. I would give each sub-group a title and they would play a convincing 'Sprinkling Stars' or 'Building a Mountain'. Twice I split them into groups, using the method described above. The third time, when we chose groups for the imminent performance, they asked if they could choose their own groups. I was dubious about this but they had worked very well so, after a brief discussion about the potential pitfalls, I let them get on with it. This gave me a strong group of three and an able and reasonably cohesive group of four. It also left four less able and apparently low status children who were not a group. None of the others wanted to work with them and they didn't especially want to work with each other. Fortunately this was a selective school (albeit on religious grounds) in a well-to-do area and the 'less able' students would be shining beacons in many other establishments. The four remaining children accepted the result of the process to which they had agreed and coalesced into a functioning group. Each group produced wonderful music in the final showing to their peers and younger children, much to my relief. Most of the schools I work in tend to be in less favoured areas and the proportion of socially able, high achieving children is lower. I am not in a hurry to repeat the 'sort yourself into groups' experiment in any of them. The fact is that able children, and I mean able both academically and socially, want to work with each other. They are usually capable of cooperating in ways less able children simply can't. But they are also capable of leading and inspiring the less able and can derive benefit from this. If there is a small amount of dumbing down from their perspective it is greatly outweighed by the overall rise in quality. And ultimately, in music at least, the session has to work for the whole class for it to work at all. 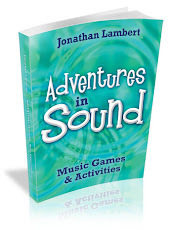 Each month I publish a free newsletter called Playing With Sound. There is always a new game or some other activity. (In February's edition, perhaps this month's highlight, I explain how to make an oboe out of a plastic straw.) Signing up is easy, as is unsubscribing if you decide it isn't for you. One aspect of it I have really enjoyed is the way it has put me in touch with people all over the world. The easy dissemination of ideas is perhaps the best thing about the internet. I recently found myself discussing Musical Chairs with a teacher, Claudia, from Uruguay. The problem with knock-out games like this is what to do with the players once they are excluded. As soon as they are 'out' their interest is suddenly diminished and they may well have a sense of disappointment. So how do you keep them happily engaged in the session? The traditional method is to co-opt them as judges but as soon as they realise you suspect their professed impartiality you have lost them again. "You have the game, (ice breaker), "Musical Chairs". In the original, after taking one chair, the person who stays without a chair, loses. Well, that brought me a lot of trouble playing it with the preschoolers, who got really upset for losing and started getting bored - misbehaving, while not playing. So with that age level I play it the same but instead of staying out, the kids have to sit down on someone else's lap, and you keep on taking chairs out and they, as a team, need to sit all on top of the others. It's very funny. And I tell them that I am competing with them, as a group. That I bet that I'll win, and I try to chase the ones that are standing up when the music stops, and it is amazing to see the kids who are sitting down, calling the ones that don't have a seat. I think it is more fun... and builds a group spirit." It does sound great fun. If you live in the UK (and probably a few other places, too), where every education and child-care establishment lives in fear of both litigation and government inspectors, you may need to carry out a health and safety assessment first, just to cover your back. If, on the other hand, you live in a country where common sense still holds sway I think you'll love this variation. Even though most of the snail mail I get nowadays comprises bills, bank statements and unwanted invitations to insure my life and chattels, I still look forward to the arrival of the postman. Once in a blue moon, perhaps three times since 1978, he brings me something special and earlier this week he did just that. 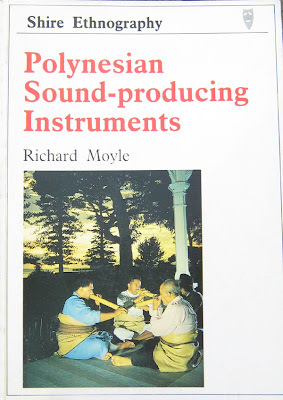 Opening an unassuming padded envelope I discovered a copy of Polynesian Sound-Producing Instruments by Richard Moyle. My brother found it somewhere and thought it might interest me. It was published in 1990 but has a very seventies look to it. The only colour photograph is the one on the cover. I'm no photographer myself but I would guess the chemicals used to develop it were last sold some time in the late 1960s. It shows four nose flautists serenading the Queen and Prince Philip at dawn on a visit to Tonga in 1953. The book is full of delights that I will share with you from time to time and describes many unusual instruments in detail. My favourite part so far stresses the importance of avoiding bum notes. Music is the food of the Gods in Polynesia and They take a keen interest: "...any performance error was construed as an insult and therefore likely to produce some form of divinely caused misfortune to one's self, family or village." Perhaps if I practise more the Gods will reward me with more pleasant surprises in the post and fewer bills. Perhaps my performance errors, and not Christmas overspend, are the cause of all January's demands for payment. Or perhaps the local spirits in Norfolk are thicker skinned (or have learned to lower their expectations) than their Polynesian cousins. About fifteen years ago I was playing flute and sax in a trio consisting of a singer/harmoniumist, a tabla/dole player and myself. We did a mixture of ghazals and the singer's own compositions and threw in the odd Bollywood number as a crowd pleaser. As well as the gigs I remember a couple of very enjoyable outings. 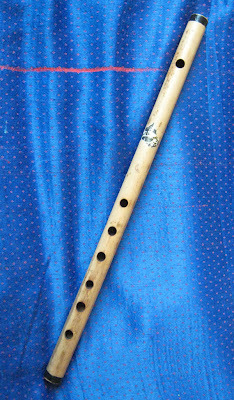 One was to Southall for food, culture (OK, I mean window shopping) and a trip to the famous Indian musical instrument shop, Bina, where I bought a bansri (pictured). Another was to meet the singer's teacher, a blind sitar player. We each had an hour's lesson with the man and, although he seemed to spend the greater part of mine on the phone or talking to family members out in the hall, he obviously knew his stuff. He taught me The Ten Thats, the ten scales that are the basis of Norht Indian music, and I was to go away and learn them. "In all twelve keys?" I asked. I typed them up on an old computer, printed them out and stuck them to my door. That PC is long gone along with the software and the file. I thought I had lost the piece of paper, too, and a quick search on the internet has not revealed the scales in a form easily accessible to the western musician. 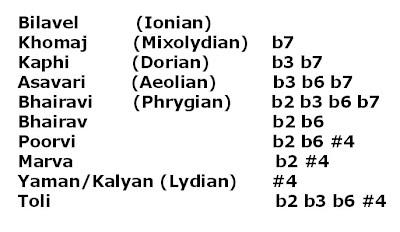 So before I lose the scales again, here are The Ten Thats, the North Indian scales, translated for musos brought up in the European tradition, as they were told to me. Assume all notes are those of the major scale unless indicated. b = lower the note by a semitone, # = raise the note by a semitone. The numbers represent scale degrees. I have put the equivalent mode in brackets where one exists. At the very least they represent a vehicle for getting to know your chosen instrument a little better. I have found them inspiring and still refreshingly exotic. And do I know all 120 scales by heart? No, but every so often I move a little closer.